Dragon Master Video Slot Review - Casino Answers! Dragon Master is a 5-reel, 20/25-line video slot found at Random Logic and Vegas Technology casinos, featuring a wild symbol, scatter wins, multipliers and a free spins feature. You can play the Dragon Master video slot at Random Logic casinos such as Bovada and Vegas Tech casinos such as Bovada. 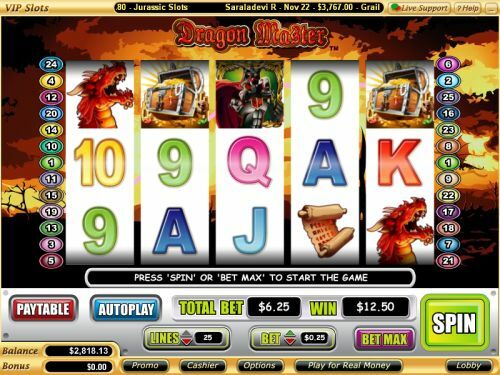 Bets on the Dragon Master slot machine are $0.01, $0.05, $0.25, $0.50, $1, $5 and $10 per line. 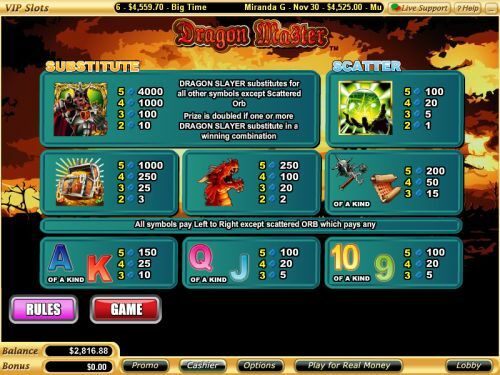 You can play up to 20 or 25 paylines on the Dragon Master slot game. You can bet anywhere from a penny per spin up to a maximum total bet of $200 or $250 per spin. Dragon Master has a great betting range that is suitable for casual players and high rollers. To play the Dragon Master slot game, select your bet and press the “Spin” button. You can also use the “Bet Max” button to play all 20 or 25 paylines. Dragon Master’s top paying symbol is the Dragon Slayer symbol. If you land 5 Dragon Slayer symbols on a selected payline, you will win the 4000 coin top jackpot. The Dragon Slayer symbol is wild and will substitute for all symbols except for the Scattered Orb. When the Dragon Slayer symbol substitutes in a winning combination, it will act as a 2X multiplier. The second highest paying symbol is the Treasure Chest symbol, which can pay out up to 1000 coins. The Orb is the scatter symbol on Dragon Master. You can receive a scatter payout by landing two or more Scattered Orbs on the reels of Dragon Master. You can win up to 100X your total bet in scatter wins. When three or more Scattered Orb symbols appear on the reels of the Dragon Master video slot, you will win 10 free spins at a 2X multiplier. All wins during the free spins feature are doubled. During the free spins feature, symbols can turn into Dragon Slayer wild symbols. The free spins feature can be re-triggered. Free spins are played at the lines and bet of the triggering game. Free spin wins are added to payline and scatter wins. You can win free cash by triggering this feature on the Dragon Master slot game at Bovada and Bovada. Hit “Autoplay” to open up the Dragon Master autoplay mode where you can select the number of spins (5, 10, 25, 50, 100, 250 or 500) and number of seconds between spins (0.25, 0.50, 1, 1.50 and 2). Stop settings include stop once all spins are complete, stop when jackpot is won, stop if a win exceeds or equals ($50, $100, $150, $200 or $250), stop on any win and stop if credits increase/decrease by ($50, $100, $150, $200 or $250). You can cancel autoplay on the Dragon Master online slot at any time. Dragon Master has a decent top payout, a wild multiplier symbol and a free spins feature where you can win a lot of cash. You can play the Dragon Master video slot when you sign up and make a deposit at Random Logic casinos such as Bovada and Vegas Tech casinos such as Bovada. Where can players from the USA play the Dragon Master video slot? If you’re located in the United States, you can play the Dragon Master slot game at Vegas Tech casinos such as Bovada. If I’m not located in the United States, where can I play the Dragon Master online slot? Players from outside the United States can play the Dragon Master video slot at Random Logic casinos such as Bovada. Where can I play a free flash game of the Dragon Master slot machine? You can find a flash version of the Dragon Master video slot at 888 Casino. You can play for free or real money. If you have any difficulties playing at the flash casino, make sure you have the newest version of Adobe Flash Player installed on your computer.